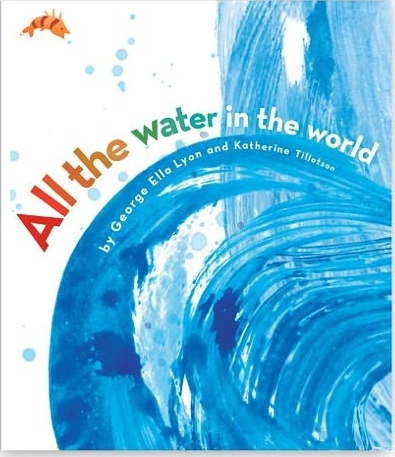 This is a kid’s book that definitely improves with multiple readings. My first take was “meh”, but reading it again yielded details unseen and not appreciated before which added to the experience. The first thing you notice once you open the book is that the actual physical pages get smaller and smaller as the story progresses – the bigger the characters are on those pages, the smaller the actual size of the pages – which makes things rather fun. How does a giant open her tiny book with her huge hands? With lots of color and rhythm, this story has lovely detailed drawings to draw the little book reader in and the varying page size helps to keep it interesting. Not too much of a story, but it’s just right for little fidgets. Overall, a fun read for all involved. 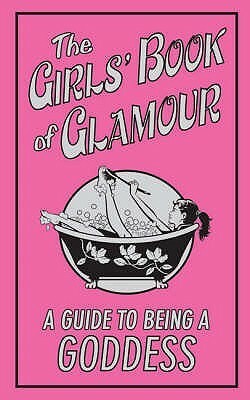 A handbook designed to teach young girls and tweens how to be “glamorous” – be prepared to have your kitchen cabinets raided as this book details how to make your own soap and lotion using everyday ingredients. It also covers other areas such as how to walk in high heels (I can’t do that! ), how to host a spa party with friends, and how to make sure your skin looks great. This is not a book focused on self-esteem or the importance of school, but it might help a young self-conscious person feel a little more confident in the world of elementary and middle school. (Warning: This book encourages (very light) make-up. Just FYI.) This would be ideal if you have a child who is *dying* to play with make-up and all that jazz. The one weakness to this book is that it’s not particularly multi-cultural, but quite a few of the ideas would work with any young person. 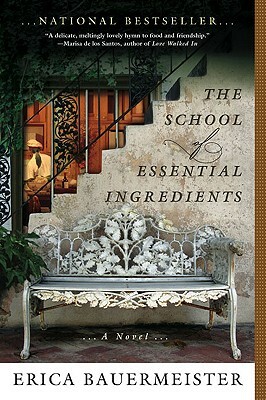 A fun and light-hearted read for curious minds. 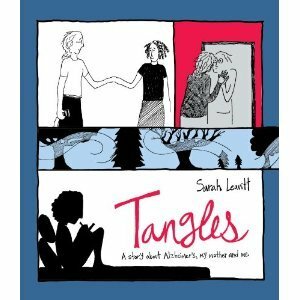 Subtitled: A Story About Alzheimer’s, my Mother and Me, this is a poignant graphic novel (sort of serious comic book and not for kids) about one family’s journey into becoming the caregiver for their mother. A person who was very independent, smart and who “loved ferociously”, this chronicle invites the reader to experience some of the family’s thoughts and feelings as Alzheimer’s affects the health of their mum. This is not the easiest reading experience, but it is very well done and effectively portrays how the disease took their mother’s bright personality away and replaced her with an unpredictable stranger who happened to look like their mum. This is sad, but it handles a real-life situation with grace and class without giving the impression of a perfect family (because who is?) After reading this book, I really feel for families who have to care for someone with this disease. A poignant and powerful read. Growing up, I was well aware of Paddington the Bear – the books, the movies, the stuffed animals, the keychains… However, for reasons unknown, I veered away from reading our really nice boxed set of Paddington books and that’s a big shame as I would have loved them even more when I was a child. Browsing in a charity shop the other day, I came across a later Paddington book and thought I’d see what all the fuss was about and now I understand. 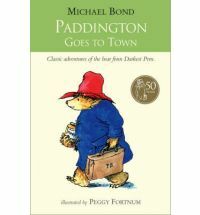 I am wondering how many other kids are out there who haven’t read the books and just know Paddington from the marketing industry. What I really enjoy about reading the books in this series is the sense of humor that Bond employs for his characters, both bears and otherwise. It’s a sly sense of humor, pretty dry (which is my favorite) and made me laugh out loud in quite a few places. I also loved that he has lovely manners, and tries his very best to not get in trouble, but like the sticky marmalade he loves, it’s always close by. Oh, and I can’t resist Paddington’s “hard stares” when someone does something he thinks is wrong or disagreeable. Just cracked me up every time I read that. Pen/ink illustration by Peggy Fortnum who did the original drawings on publication. In case you’re not familiar with Paddington, he was found by the Brown family at Paddington railway station where he was in the Lost and Found after having stowed away in a lifeboat from Darkest Peru. He had grown up with an old auntie who had entered a retirement home and who had told the fat little bear to go to England. So he did. He lived for weeks at sea on marmalade and was a bit scruffy when he landed in England. His old auntie had put a label on him saying (as most people know): “Please look after this bear”, and luckily enough, Mr. and Mrs. Brown were sweet enough to take him home in a fostering capacity which seems to have lengthened as the time goes by. Being chapter books, each chapter starts a new adventure usually with things “just happening” to Paddington. He doesn’t cause any problems, he’s not malicious but he does tend to be in the wrong place at the wrong time sometimes. His adventures are mostly benign – upended flower pots, having a cup of tea with one of the shop owners in town, having his first bath – so they are perfect for kids to relate to, and yet there is enough adult humor in there (subtle though it is) that the books are not boring for adults to read. The stories are also relatable in other cultures (generally speaking), and although these are very “English” books (lots of hot tea around), the events occur just the same in most other nations. I have also seen that you don’t necessarily need to read the books in a particular order. If you go chronologically, then you can see how the story builds, of course, but each book seems to work perfectly ok as a stand-alone by itself. 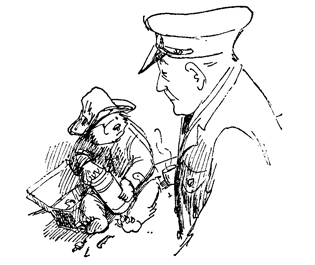 My favorite illustrations are those in the original books by Peggy Fortnum as Paddington is more bear-like and less Disney-fied. He looks like a little bear as opposed to a stuffed toy in these pen-and-ink drawings, and he’s much more appealing to me. I so wish that I had read these when I was a child, but perhaps the reason I love them now is that I can now appreciate them more. Who knows? I do know that these adventures of a little bear from Darkest Peru are really fun to read for almost any age. Interesting aside: Just found out that Colin Firth is to play Paddington the Bear (as his voice anyway), and Hugh Bonneville (Downton Abbey) and Sally Hawkins will play Mr. and Mrs. Brown. The film sounds like it will be a mix of CGI and real actors and I’m curious to see how it turns out. 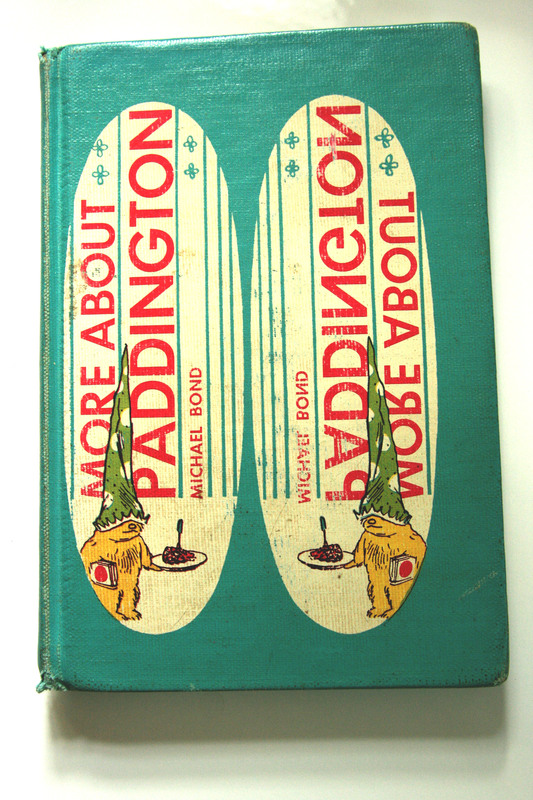 A 1960’s book cover of one of the Paddington books. 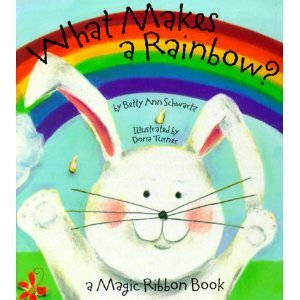 A baby rabbit asks its mommy what makes a rainbow and as you read the story, there is a charming surprise – a brightly colored ribbon threads through each page. Each real ribbon is a different color and as you read through the book, more and colored ribbons are added until, on the very last page, we have a lovely complete rainbow to look at. 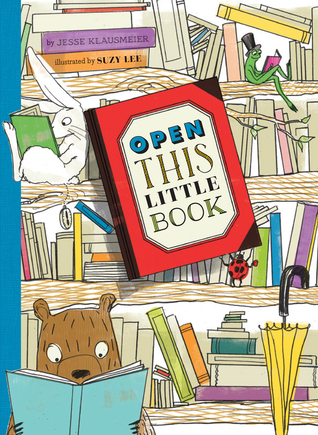 This is such a charming and gentle book which is fun to look at and fun to read. Just loved those ribbons! Apparently, there are several of these ribbon books in the series so there may be one that is just right for your youngest reader. 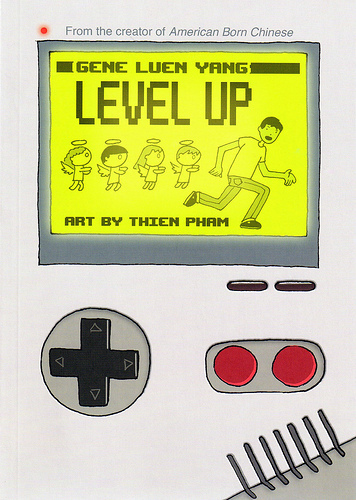 A graphic novel about a young Asian-American man who is struggling to fulfill what he believes his parents’ dream for him: going to medical school. However, the character would much rather play computer games and is really very good at them. In trying to do what he feels he has to do (by going to med school despite his doubts), he learns about the power and the importance of being true to yourself as well as the value of respecting others. He also learns how unreliable one’s memory can be at times. It’s a quick read with a story that almost every person can relate to at some point in their life – the importance of sticking with your dreams while trying to please others at the same time. Great water-color illustrations bring it all together. Keep in mind that this is a graphic novel (not a comic book a la superhero) and so covers some more mature themes. 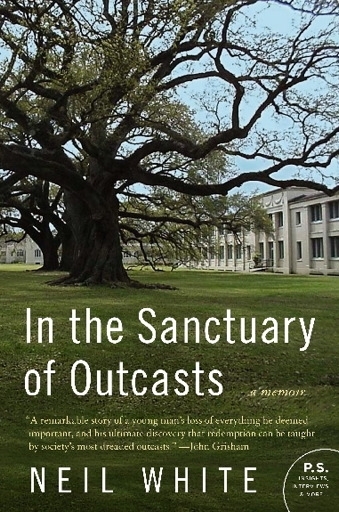 A non-fiction book about a man who was convicted of kiting multiple business checks and then assigned to a prison in Louisiana which was a former leprosarium, or care facility for people who had had leprosy (or Hansen’s disease). The authorities were in the middle of a transition from hospital to federal prison so when White entered as a prisoner, there was a mix of both felons and patients living on the same campus. It’s an interesting story. I found White himself to be a bit annoying in that he was not particularly contrite about his criminal behavior (he’s more annoyed that he got caught), but aside from that, the actual history of the hospital/prison and the stories of both the prisoners and the patients make for a fascinating read. This was written in the 1990’s, when leprosy was rarely mentioned in typical conversation and most people think it’s a disease that’s belongs in the Olden Times. So it was fascinating to see the histories of the patients who had chosen to stay in the hospital grounds despite the official gradual transition to being a federal prison. It brings up the question of “who was the prisoner” in the end? Short chapters make it a fast read, and it will give you lots to think about. This would be a good choice for book groups, I would think. Note: Bauermeister is also a co-author of a great reference book for women writers if you’re curious in off-the-beaten-path books: 500 Great Books by Women. Went and did a bit of thrifting (charity shop shopping) over the weekend, and at one of the local Goodwill shops, found a large number of kids’ books that were in perfect and unread condition. It was a sad state of affairs, I thought, because the books were good ones, but clearly no one had even cracked open a page of them. 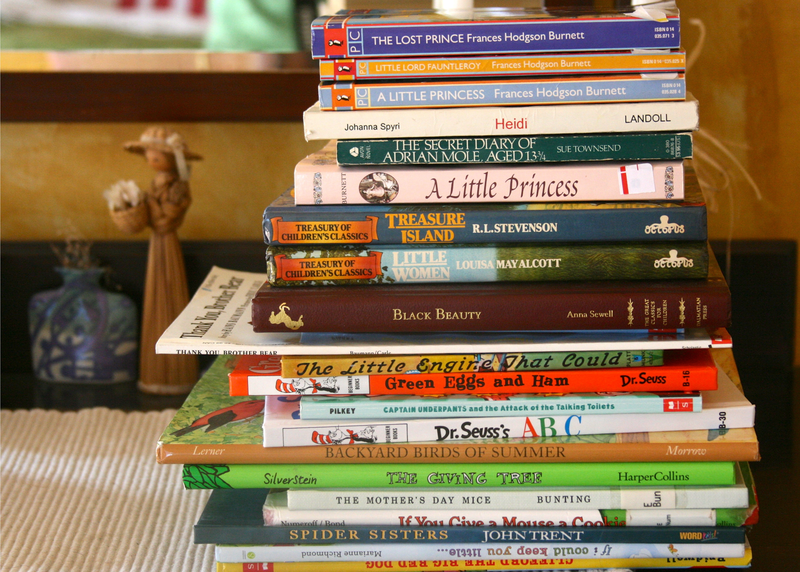 So – sad for them, but good for me as I got all these books (most brand new) for the price of buying just one kids’ book. So – the brand new ones will be saved for Toys for Tots in December, and then the remainder (all in good condition but not brand new) will get donated to a local kids’ book drive. Hooray for cleaning out bedrooms and for fortuitous finds at Goodwill! Peter Pan – Rough Kid Lit…! 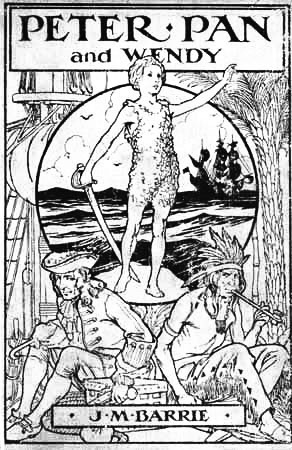 Happened upon the title of classic children’s lit, Peter Pan by J. M. Barrie (1904), and thought I would read it and see how it was. Having grown up (along with thousands of others) on the Disney version, I was surprised by how dark and violent the original story really was. 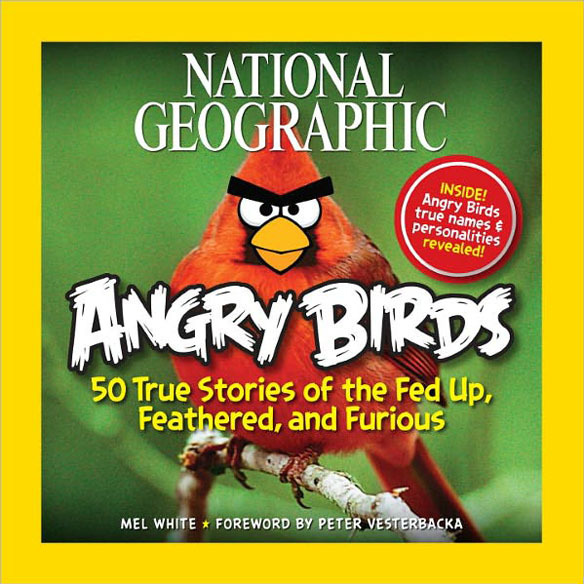 It’s still classified as children’s literature, but wow – it’s a bit rough around the edges. Tinker Bell is actually really mean, jealous and spiteful – none of this little gentle flickering light of kindness fluttering around…. 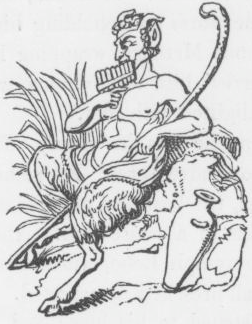 (Left: Image of Pan from Keightley’s Mythology (pub: 1852).) Assuming you know the basic story, I was really intrigued by all the details of the story and how the characters behaved. The group of Lost Boys who follow (and worship) Peter Pan have some serious psychological issues with regard to mothers (and thus Wendy), and the boys rely far too much on Peter’s direction when it is actually a case of “the blind leading the blind”… They are all a case of extremely arrested development, and can only remember snippets of their lives before Neverland, so using this spotty knowledge only gets them into more trouble. There is a lot of violent murder on the island: at least a murder a day (done by the Lost Boys or the Indian tribe on the island, the pirates or maybe a mermaid or two), but the population doesn’t seem to shrink – ever. They never seem to run out of people to kill. And speaking of Wendy, I had no idea that the English phrase of “Wendy House” (referring to a child’s play house) was related to this (although it seems obvious in hindsight). The Lost Boys built a house around Wendy when she arrived and was unconscious, so it was a Wendy House. I even think the play school my siblings and I attended was called the Wendy House, but that might be wrong. And the misery doesn’t even end when the Darling/human children return home to their parents. Mother agrees to let Wendy go back with Peter for one week a year to do his Spring Cleaning. (Yeah for parenting skills!) And then, years later, when Peter comes back, un-aged as he is, he sweeps up Wendy’s kids and future kids “as long as children are gay and innocent and heartless”… And apparently this is ok with everyone. Linked with friendship is the fact that in 1897, Barrie was in London’s Kensington Gardens when he came across five young boys, all brothers and called the Llewelyn Davies family. 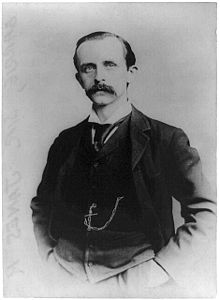 “Uncle Jim” (as Barrie became known to the family) was a frequent visitor to the boys’ home and would entertain them with stories during his visits, and it is thought that he based the story of Peter Pan on these young boys. The boys’ father died in 1907 and their mother in 1910, Barrie (in a somewhat bizarre manner) ended up being the boys’ guardian for the rest of their lives (though most of them wouldn’t live too long). It’s all rather strange and Wiki has the details here (as true as Wiki can be).